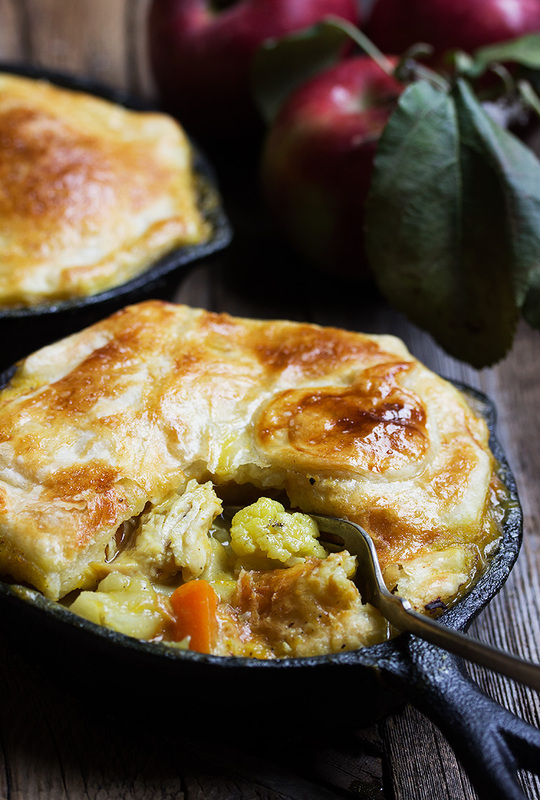 This delicious Turkey and Apple Curry Pot Pie is a wonderful combination of hearty turkey, sweet apples and a bit of curry spice. All topped with a crispy, golden puff pastry topping. A perfect recipe for your leftover turkey! 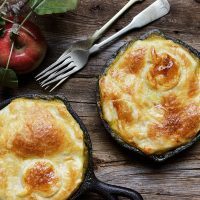 You could hardly be blamed if you looked at these skillet pies, alongside the apples and immediately imagined a sweet apple pie. While there is certainly nothing wrong with that, these pies use apples in a different way. This savoury main dish features apples together with chunks of turkey, Fall vegetables and a delicious curry-flavoured gravy. Disclosure: This post is sponsored by the Ontario Apple Growers. As always, all opinions are my own. I was inspired to make this dish by a recent trip I made to a beautiful apple orchard near Port Perry, Ontario. The Ontario Apple Growers arranged a tour for a number of Ontario food bloggers at the Nature’s Bounty Apple Farm. We spent the day wandering the orchards and learning about the types of apples grown in Ontario, the changing taste of apple consumers (a whopping 89% of people preferring a sweeter apple) and how the apples are grown. It was clearly a good year for apples in Ontario, as the trees were absolutely loaded with beautiful fruit. Ontario Apple Fact: Did you know there are 200 commercial apple growers in Ontario? Ontario’s Apple Orchards grown 16,000 acres of apples and 15 apple varieties. Ontario’s apple farmers follow the highest production standards, ensuring there is always an emphasis on quality, freshness and flavour. Of course, I brought home a bag full of those beautiful apples and when I thought about what to use a few of them for, I immediately thought about combining them with the surplus of post-Thanksgiving cooked turkey A post-holiday turkey curry is a classic British dish, while many also love to use turkey in a pot pie. I thought it might be fun to combine the two! Ontario Apple Tips: Love a tart apple (like me!)? Look for Northern Spy or Idared Ontario apples for the tartest varieties. Spartan, Empire, Courtland, McIntosh and Crispin are good semi-tart choices. 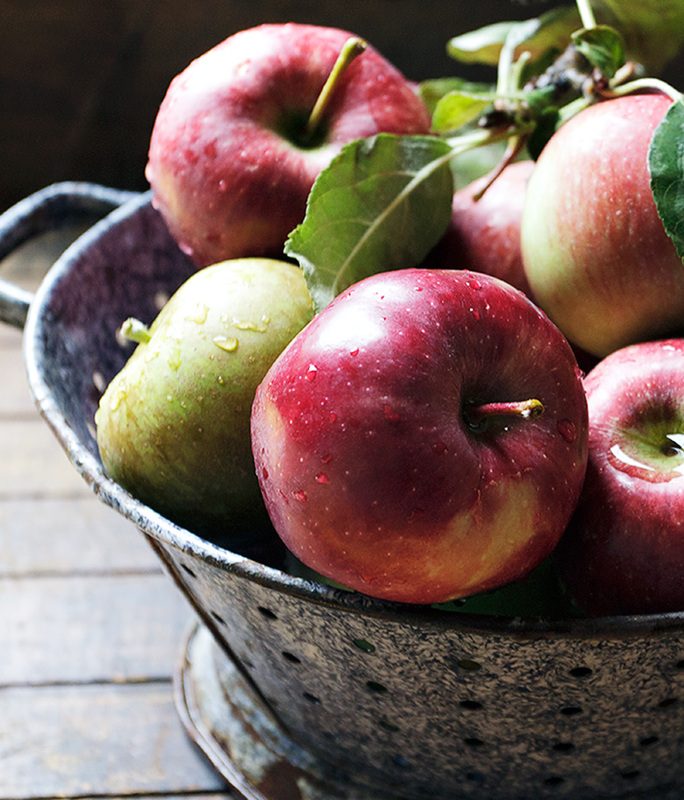 Sweet apple lovers should look for Ontario-grown Ambrosia, Fuji, Gala, Golden Delicious, Red Prince, Honeycrisp, Jonagold and Red Delicious apples. 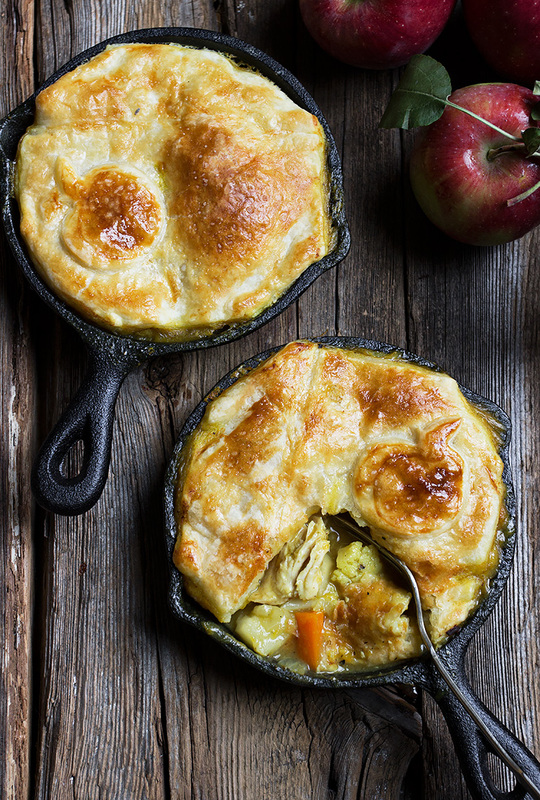 This Turkey Apple Curry Pot Pie is not only easy, but a delicious all-in-one dinner. It’s chock full of wonderful Fall butternut squash, carrots and cauliflower, along with chunks of turkey and a lovely light note of sweet from the apples. The gravy uses mild Indian curry powder – a wonderful blend of turmeric, coriander, cumin (and more), that goes perfectly with the flavours in this dish. No left-over turkey? You can roast up a turkey breast to get some turkey without cooking the whole bird. Chicken would also be lovely in this dish. Make it super easy by using left-over chicken or even a store-bought rotisserie chicken. 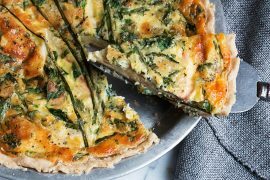 You can make these pies in individual servings in small skillets or shallow serving dishes or make it as one large pie in a large skillet or baking dish. A 9-10 inch round dish is about right for one large pie. You can use pretty much any apple in this dish, though I’d recommend a firm, tart or semi-tart apple. If you are an adventurous eater, try adding some raisins to the pie! Raisins are a common addition to Indian curries and provide a lovely complement to the savoury flavours. 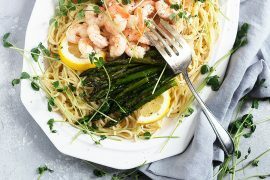 Disclosure: Seasons and Suppers is a participant in the Amazon Services LLC Associates Program, an affiliate advertising program designed to provide a means for sites to earn advertising fees by advertising and linking to amazon.com. The price you pay as a consumer does not change, but if you make a purchase I will receive a small commission which helps me to keep Seasons and Suppers going! Wondering what Ontario apples are best for pies? Northern Spy are the gold standard for pies (just remember “Spys for Pies”) Spartan, Cortland and McIntosh are also good choices for pies. Look for Golden Delicious or Empire for apple sauce. Red Delicious, Jonagold, Idared, Red Prince and Crispin are all great choices for baking or cooking. Can be made in 4 small skillets or serving dishes or one large dish (or skillet). You could use cooked chicken instead of turkey in this dish, as well. Heat butter a large pot or Dutch oven on the stove-top over medium heat. Add onion and cooking, stirring occasionally, until softened, about 3-4 minutes. Add chopped vegetables and cook, stirring for an addition 3 minutes. Add flour and cook, stirring, for about 45 seconds. Add stock, apples, turkey and curry powder. Bring to a boil, then reduce heat to medium-low and simmer, uncovered, until vegetables are tender, 10-15 minutes. Taste gravy and add salt and pepper. Be sure not to under-salt, as it is necessary to bring out all the flavours in the dish. Add a bit more curry powder, as well, if you feel it needs it. Remove pot from heat and allow to cool a bit while you prepare the pastry. Preheat oven to 400 Using two 10x10-inch sheets of puff pastry, cut 4 circles the size of your serving dishes (or use just one if you'd like to make this in one large skillet). Fill skillets with filling, allowing room for the pastry top. Fit a round of puff pastry over-top. Brush top with beaten egg and cut a slit in the middle to allow steam to escape. Place on to a baking sheet (to catch any bubble-overand bake in pre-heated oven until filling is heated through and puff pastry topping is golden, about 15-20 minutes. I love this fall comfort meal and the touch of curry is just perfect! This is my favourite kind of comfort food. I love turkey and apple together and inside a delicious pot pie is almost too much for my taste buds to handle. Almost! Love it!! I would have never thought to add curry here, but I can totally see how it would work! 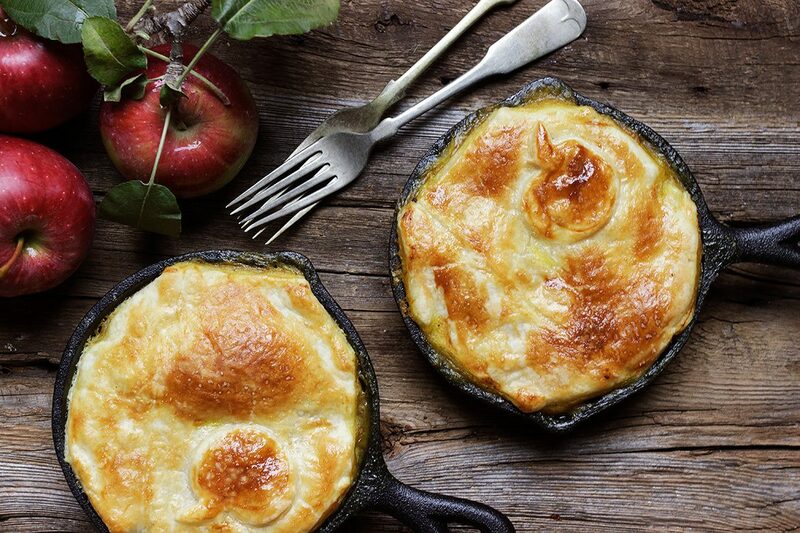 These pot pies look super delicious for a cold day. holy moly! i love pot pies and curry, but never made them into one dish. can. not. wait. to try!! Oh my goodness, Jennifer! I seriously want to face plant into one (or all) of these pot pies! They look insanely delicious! And that curry-flavoured gravy has me drooling! This is the ultimate fall or winter meal! Pinned! Cheers! This looks fantastic Jennifer. I love that you could use rotisserie chicken or leftovers from turkey or chicken dinners. It’s such a fun twist on traditional pot pie and the crust looks amazing! If you looked up fall comfort food on Google – I think this is the photo that should appear! What a fascinating combination of flavors. I love that little bite of apple in a warm, rich gravy loaded with turkey. This looks totally moan-worthy! 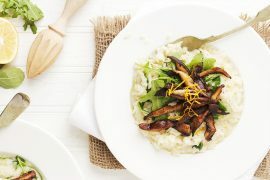 Butternut squash is a favorite too – perfect all the way around. Pinning and sharing! Thanks Tricia :) The butternut squash in this breaks down quite a bit and makes the gravy wonderful creamy and flavourful. Loved that part! Oh Jennifer, you are speaking my language with this recipe! Tom and I love pot pies and one with turkey, apples and my favorite spice curry?? I cannot wait to try this. I’m drooling already! Thanks Mary Ann! It was an absolutely delicious combination of flavours! Ontario apples are the best. This is such a perfect recipe for the weather we are getting in southern Ontario right now. I have everything on hand for this… thanks!